Urinary tract infections are most often caused by a bacteria called E coli. When populations of E. coli over grow in the urinary tract they can cause inflammation and irritation. Urinary tract infections are not seriously life-threatening but they can complicate if they are left untreated. 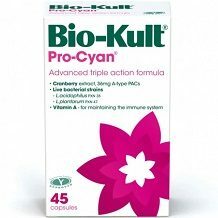 Bio-Kult Pro-Cyan is a natural product designed to relieve urinary tract infections. This review focuses on it’s properties to determine if it is a quality product. Vitamin A is a very important molecule for the functioning of the immune system. It helps specific proteins in the immune cells to perform their functions. So taking a boost in vitamin A can give the immune system the edge it needs to help clear the infection. The cranberry extract contains high numbers of antioxidants, which react with the toxic chemicals that are released in a UTI, so that they don’t cause more damage. We were really quite surprised to find that the manufacturer included probiotic bacteria in the supplement. 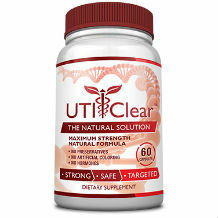 Probiotic bacteria can help to ward off an infection, but only if they reach the urinary tract. It is difficult to imagine how they could do that when they are in the intestine after being swallowed, and don’t usually enter the blood. Even research that studied probiotic bacteria determined that they have to be administered directly into the urethra, as a suppository. One to two capsules must be taken once or twice a day with food for adult usage. Customers should try and take the highest prescribed dose as possible that they can tolerate without experiencing any adverse effects. The manufacturer states that children under 12 can use this product. Due to the probiotic bacteria, this product may cause an upset stomach. Cease use of the product if the symptoms of the upset stomach do not pass within a few days. The manufacturer is also quite certain that this product is safe for pregnant women but still strongly suggests that they consult their doctor before using it. 45 capsules can be purchased for a price of $20.63 at time of the writing of this review. We could not find any form of discount offered by the manufacturer for buying multiple products at once or for subscribing for a regular order. We could not find any evidence of any form of a guarantee from this manufacturer. This is unfortunate, because it makes the purchase of this product risky for potential customers and it shows that the manufacturer is not completely confident in their own product’s effectiveness. Some of the ingredients in this product are proven to be scientifically effective and the price of this product is fairly reasonable. However, some of the ingredients are counter intuitive and this manufacturer doesn’t offer any guarantee. This product is likely to be ineffective and a waste of money then. Customers should rather try products that have clearly researched their ingredients properly and are confident in their product’s effectiveness that they offer a guarantee.